To improve your pastel techniques at home, nothing beats copying the work of a master painter. And, if you have not learned from the work of French Impressionist Edgar Degas, you have missed out! 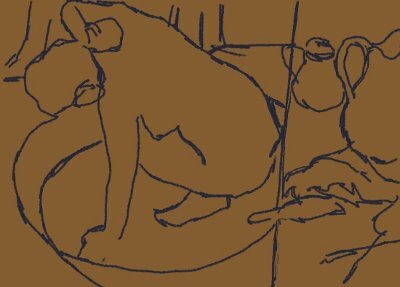 For the following demonstration, I will copy a painting by Degas entitled “The Tub”. 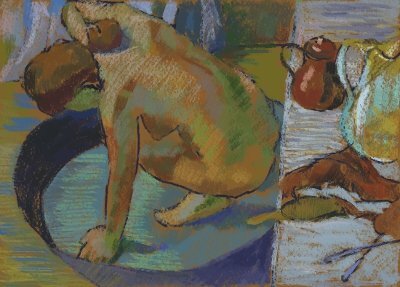 It's a good choice, because Degas used several different techniques in this work. Before I start the work, I spend some time reading about the pastel techniques and supports that Degas. This research helps me better understand his painting process, and that makes it easier to reproduce his work. The original work is 23” x 32”(60cm x 83cm). I am copying it from a print that is 10” x 12”. Getting a good quality of image to work from is vitally important. One option is to buy a poster with high quality color reproduction. I start by making a rough sketch of the subjects with sharpened hard charcoal. 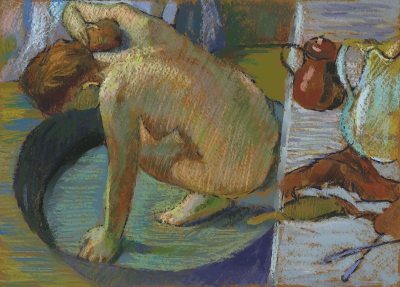 Degas liked to partially reveal his sketch lines. I use some heavy lines here, but later on they will either be covered or toned down by colors. I lay down patches of color in big masses with Nupastel sticks. I tilt the Nupastels and use the side to lay down the colors. I also use my semi-soft Rembrandt pastels for some intense colors, but I use a light touch to avoid clogging the tooth of the paper early on. Color patches that are obvious to my eyes are what I am after now. I focus on dark tones and middle tones first. I reserve the light patches on the bather's body for later. Still using a light touch, I now switch to semi-soft and soft pastels and build up layers of colors. I hatch and crosshatch the pastel colors. I begin to lay down the bather's light tones. 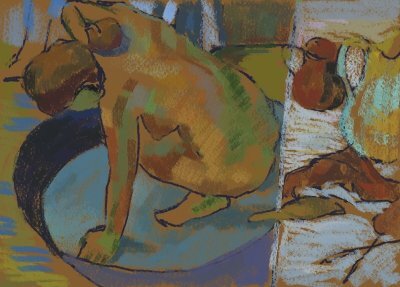 I mix and match the colors Degas used on the bather's body. I find that green, orange and dull red is what makes up the flesh tone. No blending at this point! Just lots of loose and broken colors weaving into each other. I still keep the pressure very light on the soft pastels because I do not want to fill up the paper tooth too fast. When looking up close at the original painting, I see a lot of loosely hatched strokes on top. Degas may have smoothed some of the pastels underneath, but mostly he seems to have avoided blending. I use fixative to spray parts of the painting, using more in the dark passages where it helps me make it even darker. I observe that the light tone on the bather is pretty cool. I use pale dull green first, then hatch it over gently with a pale pink color, being careful not to obliterate the green underneath. This process is called scumbling. I continue to adjust the tones all over the painting. Lastly, I unify and soften the colors by hatching all over the bather's body (once again, I am scumbling). Lastly, I create highlights with soft pastels on the bather's hair, hand and foot, ear, etc. I also add highlights to the still life on the right: the brass kettle and the water pitcher. He usually used a dark brown surface for his pastel drawings--sometimes with a lot of texture (like cardboard). I am afraid that the supports for his stunning pastel paintings would not meet modern archival standards. This explains why some of his pastel paintings have become darker over the years since they were not acid free. He used fixative or steam liberally to darken and/or seal the pigments. Hence, some of his pastel works seem quite dark and the colors are dull. I suspect that the fixative he used was not archival quality, either. Hatching and crosshatching are his main techniques for mixing colors on the paper. He uses scumbling (light opaque colors over dark colors) to unify the colors and mix colors optically. He sometimes used tools like a knife to scratch the painting for a scraffitto effect. Looking at his pastel techniques, you can see that Degas was quite ruthless with this very forgiving medium. And now you can learn his pastel techniques by copying his paintings and apply them to your own work. As long as you follow the general rule of 'soft over hard' (using hard or semi-hard pastels first, then semi-soft and soft pastels later), then the sky is the limit! If you are a total beginner, then I recommend using this particular pastel paper. It allows you to make tons of mistakes without ruining your surface. You can try various sanded papers, too. Click here for my favorite sanded paper. Since Degas' pastel supports had a lot of texture, you will get a better result emulating his style by choosing a paper with more texture. 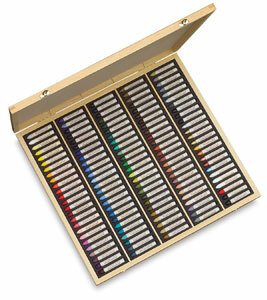 Want to learn more about pastels? Click here to explore the other supports, making sanded paper, watch a demonstration, etc. Don't have any pastels yet or simply want to upgrade your pastels? Click the image below for the soft and creamy pastels you need to create your masterpiece!